This page is a collection of real estate statistics and news for the Chicago housing market. Data on this page is updated as it becomes available. Home price data for single family homes and condos in the Chicago metro area is reported monthly and goes back to January 1987. The graph below is current through January 2019 and includes a trendline, conservatively established for single family homes during a 12 year period of rather reasonable price increases. 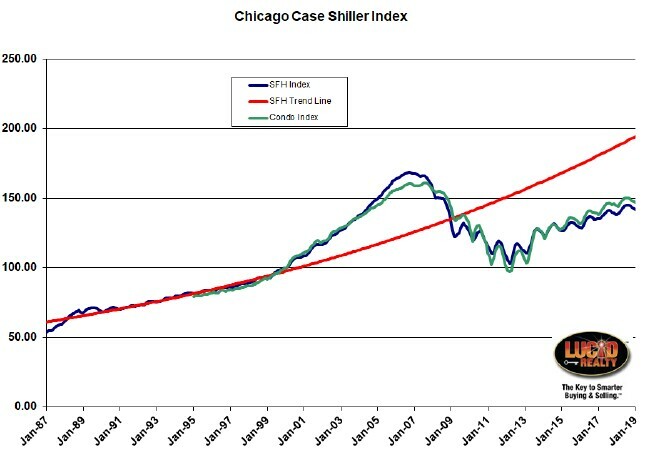 Chicago area home prices still have a way to go before catching up to the bubble peak. The index bottomed in March of 2012 and saw incredible gains in May and June of that year. Prices were up 4.5% and 4.6% from April and May respectively, which is huge. Even after adjusting for seasonality these were the largest one month increases in 24 years. Since then the home prices have made steady gains with the exception of the normal seasonal dips. January 2019 single family home prices fell 0.5% from December but were up 2.4% from a year ago. Single family home prices are now back to the level seen in May 2004, having fallen a total of 15.9% from the peak in September 2006. However, the index is running 27.0% below the trend line, but that gap may never close since inflation is not what it used to be. Condominium prices were 0.1% lower than they were in December. The condo index is now back to April 2005 levels, having fallen a total of 8.5% from their peak in September 2007. Condominium prices were up on a year over year basis by only 1.8%. Please note that these numbers are based upon a 3 month trailing average of home sales so they are looking back pretty far. The IAR tracks monthly units sold for the Chicago Primary Metropolitan Statistical Area (PMSA), which includes a broad area of Chicago and its suburbs. Units sold can be a leading indicator of the direction of housing prices. 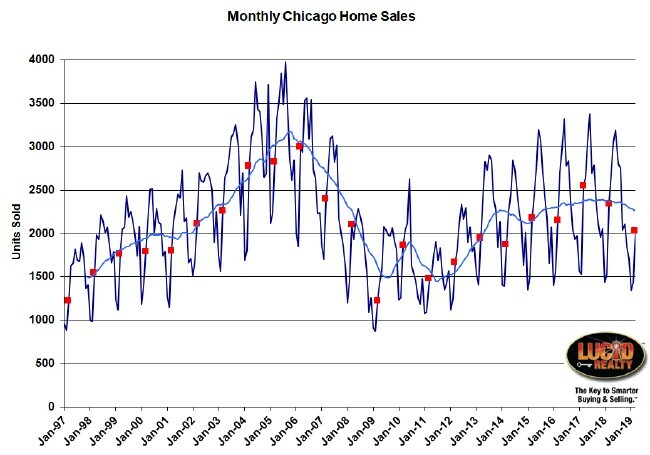 The graph below shows single family homes plus condominiums sold from January 2006 through February 2019, along with a 12 month moving average (to remove seasonality effects). In addition, we have flagged all February data points for comparison purposes. Home sales in the broader Chicago metro area have been relatively flat for 6 years. 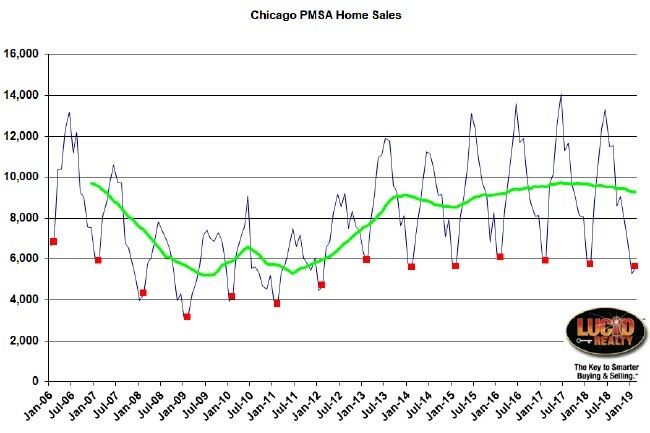 The graph shows that home sales in the Chicago area have rebounded nicely from the bottom of the real estate market but have really flattened out in the last 6 years and have recently even been on the decline. We have monthly home sales (single family homes plus condos) for the Chicago real estate market back to January 1997, before the housing bubble really started. It is current through March 2019, with all the March points flagged in red for easy comparison. In order to smooth out the seasonal patterns the graph also displays a rolling 12 month moving average of the data. As you can see the Chicago housing market activity peaked around 2005 before prices peaked in 2006 and really didn’t start recovering until 2012, which was actually the bottom in Chicago home prices. In other words, sales activity seems to lead price changes by about one year. Recently Chicago home sales have been on the decline – possibly as a result of an inventory shortage. Also, if you look at that employment graph below you will see that employment actually continued to improve after the peak in both home prices and sales activity. Now, employment is starting to approach the 2007/ 2008 peak. The sales rate impacts the months supply of inventory on the market and how long properties have been on the market. Ultimately, inventory levels impact home prices. In the graphs below we track the months supply of inventory and the market times of condos and single family homes in the city. However, there are a few problems with these statistics. A fairly significant number of properties that go under contract don’t close – maybe 20%. So, as the data ages and properties come back on the market, the months of supply numbers change retroactively. Also, the market times shown are only for properties that have sold and not the ones that are sitting on the market forever. Consequently, the market times are really understated vs. the entire population of properties that are on the market. Home inventories in Chicago had been steadily trending higher until August 2009 when they started to improve. That improving trend continued until January of 2010, when they started to bounce around a bit in the wake of idiotic government interference in the housing market. Since then contract volume started to improve while sellers were holding off so inventory levels improved considerably. Since then inventory levels of both attached and detached homes have been extremely low, though attached inventories have recently started to rise. However, technically both types of homes are still in a seller’s market. Chicago’s home inventory has been running exceptionally low in the past few years but recently the inventory of attached homes have been rising. Meanwhile, the market times for homes that have sold have improved dramatically since the housing bubble burst as the inventory has dropped. From peaks of close to 200 days we are now bouncing around under 100 days. For the most part attached homes (condos and townhomes) have sold faster than single family homes until recently. Since attached inventories have risen we have seen a corresponding increase in the market times for attached homes – to the point where they are most recently higher than for detached homes. A great indicator of long term demand for housing in any region is the employment statistics. People can’t afford to buy homes if they’re not working. Therefore, we track the employment numbers reported by the Bureau of Labor Statistics for the broad Chicago metropolitan area, which includes such towns as Naperville and Joliet. We track employment instead of the unemployment rate because the latter is strongly affected by estimates of the labor force – and it’s the employed that buy homes. The graph below is current through January 2019. Chicago area employment has nicely rebounded from the depths of the recession. These numbers had been showing growth until June 2008 when employment started to drop from the previous year. After plumbing 14 year lows, Chicago area employment finally rebounded during 2010 and has been on a general upward trend since though it seems to have flattened out recently. Chicago area employment in January hit its highest level going back as far as data is available, surpassing last January by close to 46,000 jobs. The good news is that since the bottom in January 2010 we’ve seen an increase in employment in the area of almost 373,000 jobs. The unemployment rate for Chicago is a terrible indicator of the health of the local economy. The rate can vary significantly from month to month as a result of changes in the assumed size of the labor force. Currently it stands at 4.9%, which is the highest that it’s been in 11 months. Another interesting tidbit to note is that, even though employment declined from 2000 – 2004, home sales continued to rise. Then, despite the fact that employment rose from 2006 – 2008, home sales were in a decline. So clearly employment is surprisingly not totally correlated with home sales. And when people aren’t working foreclosures happen. The following graph, based upon Realty Trac data, shows the number of properties experiencing “foreclosure activity” by month – which means that the property owners received some kind of official notice pertaining to foreclosure. However, the aggregate statistics overstate the problem somewhat in that they include all follow up notices – i.e. a distressed property will appear in the numbers multiple times as it passes through various stages of foreclosure. For that reason it’s more instructive to look at the individual components of the activity numbers, since a property is only counted once at each stage. While most of 2012 saw higher foreclosure activity than 2011, activity has trended downward since – in particular the number of homes in default. There was a huge spike in March 2015 – possibly because a logjam was broken up – but the numbers came back to earth in April and have subsequently continued to drift lower and lower. 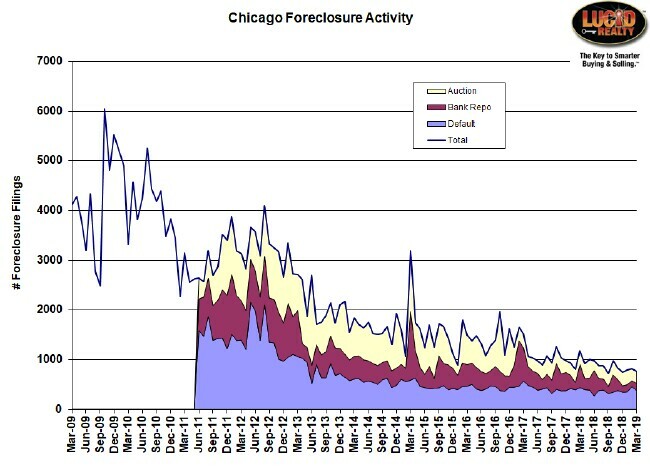 Chicago foreclosure activity has declined dramatically since the housing crisis. As you can see from the graph the numbers are highly volatile and month to month fluctuations don’t really mean that much. Even more interesting is the percentage of home sales in the Chicago market that are distressed – either bank owned or short sales. The percentages are clearly seasonal, dropping off during the summer when there is plenty of inventory but rising during the winter when the more desperate sellers tend to be out. 8.4% of March’s sales were distressed, which is the first time that the percentage has risen from the previous year. That is a sure sign that this measure has finally bottomed out. 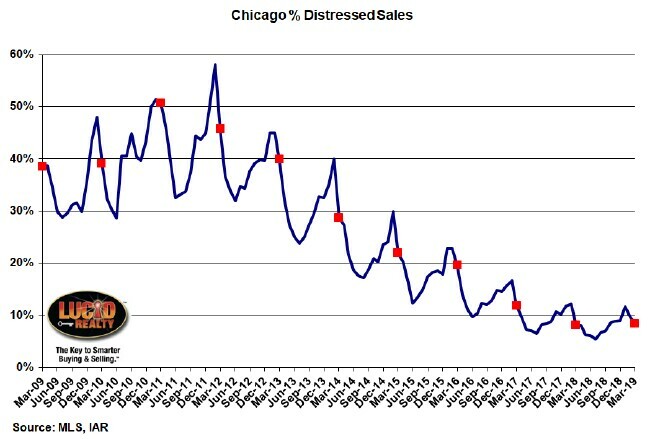 I’ve opted to produce my own data for these distressed sales rather than use RealtyTrac’s foreclosure sale numbers. I’ve seen too many peculiarities with the RealtyTrac numbers to trust them and at least I know that these numbers come from a reliable source. I think RealtyTrac is grossly underestimating the number of foreclosure sales in Chicago. For each of the following Chicago neighborhoods we provide trend data for condo inventory and the number of days on the market for sold condos as an indicator of the health of the neighborhood real estate market. We update this data approximately every two months. The stock market has an uncanny ability to predict the future – at least it’s better at it than professional forecasters. Therefore if you want to know what the outlook is for the housing market you would be well advised to look at the trend in the S&P Homebuilders index. Here is an up to date graph for an ETF that tracks this index. Note that the index keeps hitting new highs. Don’t agree with it? You are free to buy it or short it and attempt to make money on your superior knowledge. But be careful. Smarter people than you have tried and failed to beat the market! Very nice article. Very informative. So the data shows that within those period nothing have much change in the real estate industry here in Chicago. I noticed the data shared on the real estate market in Chicago does not include the Far Southeast Side, the Far Southwest Side or the West Side. These are viable markets and investors would benefit from that data being included in the future reports. Well, the data for the city of Chicago includes the entire city. We just don’t have dedicated pages for the areas you reference. That’s because they’re outside our service area. We’ve only focused on the areas where we have agents working.